Home > Canada > Defence > feature > Interview > Politics > LTTE Infiltrates into Canadian political parties. LTTE Infiltrates into Canadian political parties. The growing danger of Criminalization of Canadian politics. 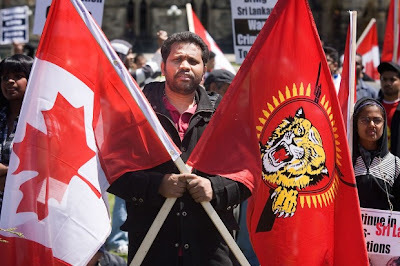 (February 04, Toronto, Sri Lanka Guardian) Conservatives in Canada have a long tradition of opposing LTTE as well as all other militant movements like Hamas, Hezbollah, Taliban and Al-Qaida. The first thing that Conservative did after winning a minority Government under Hon. Stephan Harper was to ban the Liberation Tigers of the Tamil Eelam (LTTE), prescribed as a Terrorist Organization. The Conservatives has not only kept their election promised fulfilled but gained a vast support from all section of the Canadian society. The Conservative Party of Canada has made it as a policy announcement much before winning the election and during its election campaign that it will ban the LTTE, if voted to power and it was well known to the Tamil Diaspora tightly controlled by LTTE, the danger of banning by Conservatives if elected to office. Therefore during the Canadian Federal election of 2006, the entire Tamil Diaspora belongs to and the sole property of the LTTE, took the election campaign as a matter of life and death as well as a prestige issue and enter into the election campaign vigorously backing Liberals to see that Liberals are kept in power to avoid Conservative winning the election. The physical and monetary strength of the LTTE controlled Tamil Diaspora was utilized to the maximum to retain the power of Liberals and transporting the Tamil community particularly the old age people to the polling stations was done in the similar way as it happens in Srilanka. The LTTE mobilized its cadres, sympathizers and supporters to the fullest as a show of strength. The LTTE organizers used each and every resources including LTTE owned and controlled media the T.V, publications (papers) and radio to the fullest to make sure their supporting Liberal candidates win the constituency. We can say that the LTTE propaganda mechanism acted and worked as the mouth piece of Liberal propaganda. As the defeat of Liberals in the 2006 election was considered as the defeat of LTTE by LTTE in Canada, and by then LTTE was banned by the newly elected Conservatives by then Public Safety Minister, Hon. Stockwell Day. Before the LTTE could come out from the shock, the World Tamil Movement (WTM) the arm of LTTE’s International operations was also banned. This was a big blow to the LTTE administrators in Canada, which crippled their total network of fund raising, transfer of money to LTTE foreign accounts, procurements of weapons and ammunitions and managing LTTE’s overseas assets. LTTE then realized the graving situation of just relying on Liberals will not help for their survival and carved out an excellent master plan to infiltrate its stanch and reliable people into all federal parties to counter the danger that their voice diminishing in Canadian politics . All they did is send their loyal lieutenants into all federal parties and their best choice was ruling Conservatives. The winning of second term minority government by Conservatives with more seats pushed the LTTE leadership to infiltrate the ruling conservatives with no options left, though banned by the came party. The LTTE leadership carried out this master plan in a systematic way by sending a huge number of their supporters to party meetings and gatherings to show their strength and convince the party leaderships that the entire community is behind them, raised funds, supported selected figures whom were willing to support them and invited the party leaders for their events to uplift their status within the parties as well as within the community. The LTTE media gave importance to selected people whom were already selected by its organization having the potential of winning the party tickets, portrait them as community leaders having a strong community support and back up. This way the federal parties were fooled and eye washed by the federal parties that LTTE still enjoys the full backing of the community and the support. In fact some of their LTTE strong supporters whom are potential candidates, whom were identified as LTTE supporters, were introduced to the public and political parties as businessmen and academics. In the forthcoming Provincial election Shan Thayaparan contesting in Markham/Unionville riding for the Conservative Party ticket was a well known LTTE supporter, who was the Election commissioner of National Council of Canadian Tamils (NCCT), which is formed recently by LTTE to operate in Canadian soil. After the ban of World Tamil Movement (WTM), this is the new movement created by LTTE to officially operate in Canada. The opening of their office premises was attended by Hon. Paul Calendra, a Conservative M.P, shows the growing relationship of federal parties particularly the Conservatives, whom themselves banned the LTTE and WTM, won a massive support from Canadian public for banning them. Notably the Anti smuggling and Anti Terror laws of the Conservatives has gained a huge support for Conservatives across Canada and also making inroads into other communities for their stand to protect and safe guard Canadian public. It is very unfortunate that Conservative themselves disrespect what they believe in and do. To the contrary, the Liberals who have enjoyed the benefit of support from LTTE organizations and its supporters have never and ever issued a party ticket to any LTTE supporters or sympathizers for that matter. If the Conservatives believe that they might win the GTA through LTTE support, they will taste the defeat across Canada particularly in Northern Canada, where the traditional votes of Conservatives comes from for their betrayal. Conservatives should aware that the so called community support portrayed by the LTTE can ever elected a single Tamil so far and notably Nethan Shan a stanch LTTE supporter contested in NDP ticket. First he tried win the Liberal ticket to contest but was refused by them. The denial of party ticket to him by Liberals is the courageous act. Why could Neethan Shan win the riding with Tamil support, if there is a community backing?